Recorded live from Baldwin Wallace University in front of Tim Marshall’s Content Marketing Class, Liz & Sandro discuss using Instagram for your small business holiday campaigns. Special thanks to Tim & his entire class for welcoming us to speak to & record in front of their class. They were fantastic. Liz: [00:00:00] Hey there. Welcome back to Liz and Sandro’s Marketing Podcast. We are super excited because our next three episodes were recorded in front of a marketing class at Baldwin Wallace University. We had a great conversation & we split that conversation like I said into three different episodes. Please forgive us if the audio doesn’t sound quite as crisp as it normally does. Normally we record in a smaller studio. This was an amphitheater SEO classroom setting. Liz: [00:00:25] The space was a little bit bigger so we weren’t thrilled with how the audio came out but we think you’ll enjoy the content either way. Sandro: [00:00:32] And just a quick shout out to Diana Chittester, she let us use her equipment for this event and the audio problems are through no fault of her equipment, which is pretty fantastic. We’ll have a link to her & her music, she’s a wonderful musician, in our show notes. Liz: [00:00:47] And now onto the episode. Sandro: [00:00:51] Welcome back to Liz and Sandro’s Marketing Podcast. We are the podcast that helps your small business grow through all things digital marketing including email marketing, social media, web design, SEO and so much more. Sandro: [00:01:02] Today we are live from Baldwin Wallace University in Berea, Ohio. We are here at the invitation of marketing professor Timothy Marshall. Is it Timothy or Tim? Tim. Whom we should have on as a guest at some point which we will and also because I am an alum. Sandro: [00:01:20] I graduated from here back in 1995 when we were talking about billboards and a few professors were dipping their toes into this great new thing called e-mail. Today we are recording in front of the content marketing class, here at BW & our episode is on capitalizing on Instagram for the holidays. Liz: [00:01:37] Yes we have an episode on general holiday marketing tips that I think still ranks as one of our best episodes. Right? Liz: [00:01:45] So, we thought hey let’s do Instagram because it’s hot right now and we’re approaching the holidays. We are 33 days from Thanksgiving and 67 days from Christmas, at the time as of today. For small businesses I still think that’s time to put together a basic campaign to test. Liz: [00:02:15] I did want to point out that right now, mid-October, Dyson is rolling out a new product that they know is going to be hot for the holiday season. Dyson, a lot of people think of the vacuum company but they are getting more and more into consumer products. I think a couple of years ago it was they released the hairdryer and this year they have released the Airwave. So ladies this is big. They think it just got released last Friday. They did a big press conference and I’m starting to see all the YouTube videos come through. Most of them are paid promotion right now so I am treading lightly. I really want to see how good this product is going to be. Sandro: [00:02:51] What is that? What is an Airwave? Liz: [00:02:51] So The airwave is, it uses again all of the spinning air suction to style your hair with minimal heat and air instead of like a hot plate. Like A flat iron or a curling iron. It uses more gentle air and heat to style. It’s pretty, it’s legit. Liz: [00:03:12] I’m super excited. But my point in telling you all of this is you know it’s mid October. Dyson is rolling this out now for the holiday season. This is going to be their big product. Obviously the product itself has been in development for years. A lot has gone into the promotion of this and my point in all of this is saying: plan your holiday campaigns as early as possible. Again if you’re a small business we’re just about a month away from Thanksgiving I think you have time to put something together quickly to test. And that’s what we want to talk about today. So couple quick tips. Liz: [00:03:48] Anything else about Instagram before we get to the tips? Sandro: [00:03:52] We’re at over a billion people monthly average users, correct? Sandro: [00:03:54] So it’s definitely a place to be & seems to be more popular. Liz: [00:03:58] Yeah. And we’ve we’ve talked about this throughout many episodes comparing Snap Chat and Instagram. I mean, Snapchat’s still great. People use it but we’re just seeing so much growth with Instagram. And on a personal level. I’m seeing more and more interaction. I don’t have a business account on Instagram actually it’s just a personal account but I’m posting and suddenly I’m just I’m seeing all these comments like I think people are really getting comfortable with it and using it a lot more. Liz: [00:04:25] So let’s jump in to the tips I’ve got. We’ve got three. The first one is focuses on the tools available within the Facebook ad platform. And I do want to point out by the way people still ask me this. They’re like “oh does Facebook own Instagram?” And I’m like yes. That’s why it’s so big. That’s why it’s so important because the Facebook ad platform is so robust you can do so much with it. And one of the big things is the Look-Alike Audience. Liz: [00:04:54] So just as a reminder the lookalike audience is one of, it’s like a hidden gem within Facebook. It involves taking your your e-mail subscriber list which we’ve mentioned on podcast is your biggest marketing asset, having a really strong e-mail subscriber list taking that. Uploading it into Facebook allows you to first create what’s called the custom audience. Thank you, the custom audience so that’s that’s just your subscribers. You can serve them ads you can do a lot with just the custom audience. But then you can use Facebook’s creepiness. And you know their algorithm and they look at your custom audience and they kind of mirror it. Liz: [00:05:39] They take all of the really important attributes that you would need to further market to an audience and they mirror it and they create what’s called a lookalike audience. That audience is national. And then typically what I do when we’re working with clients is we narrow it down by zip code or geography based on what what and who we need to target. But yeah, taking your your customer list or your best customers and creating a mirror audience is going to be a great way to target on both Facebook and Instagram. You can reach people who are probably going to be interested in your product. Sandro: [00:06:16] You can also create a look-alike audience based on how the people that like your page or even like your competitor’s page. So it doesn’t just need email. Sandro: [00:06:24] But definitely would help you too. Another way is putting the Facebook Pixel up on your Web site. If you haven’t done that, now’s the time. Pixel tracks people that come to your Web site over at least six months. And you can retarget to them. You can use to track conversions you can track who’s put something in the shopping basket and not checked out. And then when you go to a different Web site and suddenly the thing you’re looking at is that other Web site. The Facebook pixel’s one way to do that. And also to track people purchasing and conversions and create an audience based on those people that have come to your Web site. So use the pixel even if you’re not intending to advertise right away you should have that pixel on you. Every web site. Liz: [00:07:06] Yeah, just have it collecting data. Liz: [00:07:08] So yeah that was tip number one use some of these built-in features because they’re fantastic. Tip number two involves good creative content. And I am going to suggest something with motion. Something with movement. Whether it’s you know just a quick GIF or a video. Thinking about myself as I’m scrolling through Instagram, the ads that capture my attention best have some animation, they have some motion. So video I really think that’s where it’s at. Liz: [00:07:43] I stop every once in a while on a static ad but I really think that if you’re going to succeed on Instagram you do need some movement and that could involve you know investing in some really good video. It could be as simple as using a tool like we’ve tested out. Sandro: [00:08:04] We talked about Lumen5 you talked about RIPL. Liz: [00:08:05] That’s right. So the first episode we recorded was testing mobile video apps. Ripl and Quik. But I think in this case when we’re talking about a holiday campaign. Depending on what you’re selling, a product or a service, you probably do want to use a desktop editing one. So yeah I think Lumen5 or Rocketium. So I did a comparison of Lumen5 and Rocketium and I do make a distinction that these are kind of dip-your-toes-in-the-water type tools. You know if you are at a point where you can bring in a videographer and have them use what would it be movie. Yeah maybe even better bites if you’re testing the waters of something like that I think would be great too to get some movement & some motion. Sandro: [00:09:02] Do you guys prefer posts or stories for your Instagram posts? Posts? Depends? Sandro: [00:09:10] I feel like stories is just getting more and more traction. There’s rumors that Instagram is going all stories, could potentially go all stories. So which do you prefer for ads? We do you think? Liz: [00:09:19] So, I prefer seeing the ads in my feed because when I’m watching stories like I’m zoned-in. Like I just want to watch the stories. And there’s it seems to me there’s an ad in between every story now which is kind of nice because it breaks it up. Like I’m like, oh, on to the next one now. So that’s good. But no, typically I just skip right past the ads in the story. I will say though that I have in my feed I have I have purchased products from ads that I have seen in the feed. Sandro: [00:09:49] Wow. 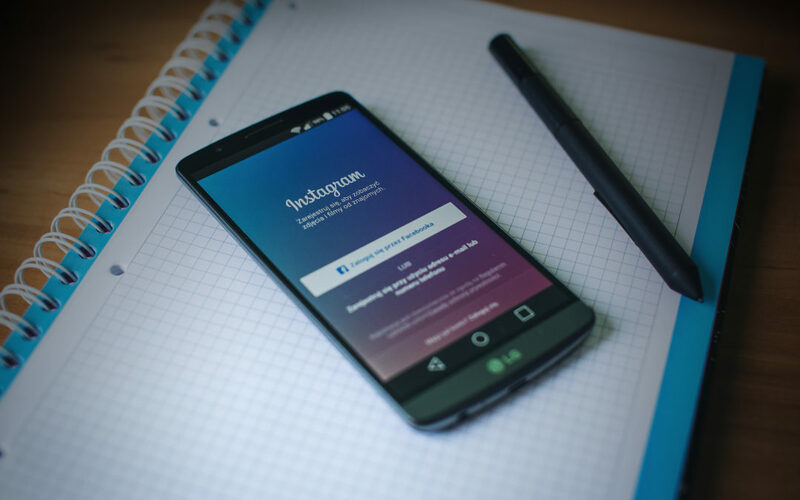 One Of the last things you want to make sure about is making sure your offer or your landing page when you advertise on Instagram is correct. You don’t want to be showing a picture of a yellow winter coat. And then they click on the ad and it goes to a pair of Lebrons or Kyrie’s. You know something that they totally didn’t think was coming. Sandro: [00:10:07] So just have all your ducks in order. Make sure your web links are correct. Everything is going to the correct landing page for your offer that you have on Instagram. Sandro: [00:10:17] And one other thing I wanted to mention, take advantage of the action buttons. There’s brand new action buttons on Instagram. If you use Rezy for your reservations or Eventbrite for your events or Yelp. Liz: [00:10:30] Yelp is on there, yeah. Sandro: [00:10:30] There’s a ton of there’s about 25 different Web sites, third party Web sites that work with Instagram now that there’s a simple one button that is free that you can link to your Instagram business account. Sandro: [00:10:42] Make sure those are linked up. It’s kind of new, it’s not too new, but make sure you’ve got the basics in order. Liz: [00:10:48] And they think you know just some final tips going back to the landing page and making sure you’re sending people to the right place, walk through it. Go step-by-step and look at it how the consumer is going to see it. Because I think you’re going to catch some things that whoa, maybe that doesn’t look right. It irks me in the Facebook ad platform, sometimes it’s just it’s just hard to see what the consumer is going to see. So yeah just walk through it as much as you can. Get second opinions. Get the opinion of your intern, your agency, your consultant, whoever you’re working with. I think that’s really important. Liz: [00:11:23] And remember that, yeah we are 67 days from Christmas so maybe you’re throwing together a quick test campaign at this point but I never think any marketing campaign is a waste because you always, you always learn something. You’re going to be collecting data you know through the Facebook Pixel. You’re going to see, wow our click through rate was way lower than we thought it would be. You know we just didn’t generate as many as much sales as we thought. And that’s okay that’s really good info to take and absorb and learn from and apply to future campaigns so. Sandro: [00:11:56] And by testing you mean different images? For the Melting Pot, we had three logos a red one, a white one & a black one. For some reason the red one got ten times more conversions than the red or the white ones. So we just stopped those & went with the red. Liz: [00:12:07] Well no I wasn’t. No I wasn’t thinking about split testing anything per se I just meant like in general put a campaign out there. Like see what happens. Because you could do nothing and then you will end up at the end of the holiday season with you know, nothing to show for it at least if you run a test campaign you’re going to have something to work with in the future. So. And then then you could get more into split-testing. But I think we should do it another episode on split-testing, a debate about it. Maybe? Well, just because. Sandro: [00:12:40] It doesn’t work? Liz: [00:12:41] No no I don’t say that. I was chatting with one of my team members. You know just doing a refresher on MailChimp and we got to the section about subject lines and I’m like Yeah we always draft a couple but like as you know like, sometimes the most important thing is just get the e-mail sent. Like just send e-mail! Don’t let it don’t debate forever about which subject line. We should just get it out there. So yeah, we can chat more about that. Sandro: [00:13:07] Well thank you for joining us and thanks everyone for being part of our show today. You will find us on Instagram, Twitter and Facebook. And if you have a question send us an e-mail, we’ll give you a shout out & a link back to your Web site. Which links back to your Web site are very important for SEO. You’ll find where you find your favorite podcasts. We are on Spotify now, iTunes and Google podcasts. Thanks again for joining us & we’ll see you next time.